A restaurant inside of a department store? I'm not gonna lie, I was very skeptical. Then I started hearing good things from my foodie friends, so decided to give it a shot. Bazille is located inside of Nordstrom on the second floor. We got there pretty early for lunch, but the place was already packed (good sign!) We were given complimentary bread to start with. I ordered the Crab Macaroni and Cheese. The macaroni was very good and I liked how they had a big slice of cheese baked right on top! There were big hunks of crab and the dish was very flavorful. 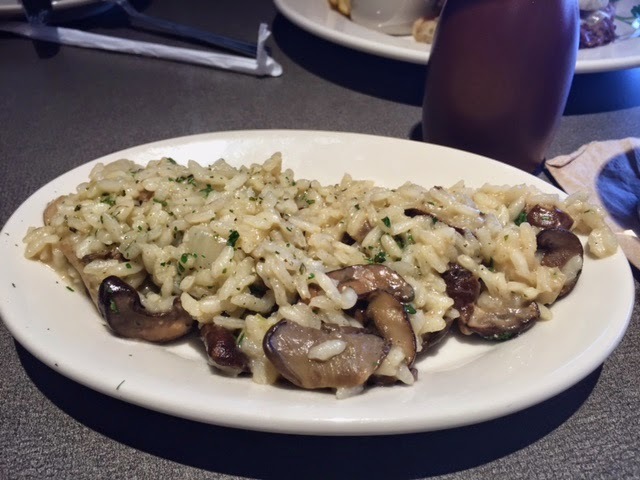 I also got a side of Mushroom Risotto. I am always on the lookout for risotto, so I was really excited to find it here. And let me tell you, it was glorious!!! The risotto was very creamy and the mushrooms were plentiful. After every bite I commented about how good it was. Not kidding. My husband got the Prime Rib French Dip. He was also very impressed and said it was one of the best french dips he has ever had. He also commented on how great the fries were. I snagged one, so I can also vouch for them! They tasted like truffle parm fries...delicious! Wow, this place is good. We were in the car on the way home and still talking about how good it was. This was seriously one of the best meals we have had in a long time. The food was spectacular and the service was wonderful. Go there!